They're known as "rectangular rapid flash beacons" (or RRFBs for short). You can find them at 134 crosswalks in Calgary, but the city is looking to buy more — many more. You might have noticed crosswalk signals on the sides of some Calgary streets, instead of overhead. 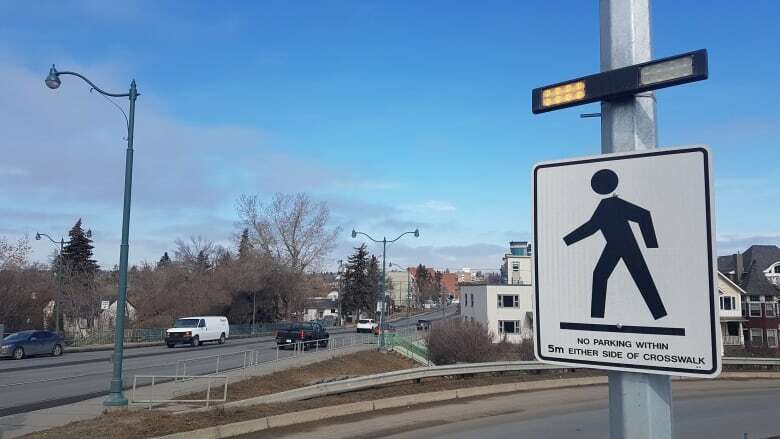 They're known as "rectangular rapid flash beacons" (or RRFBs for short) and you can find them at 134 crosswalks in Calgary. But the city is looking to buy more — many more. It recently put out a request for proposals, asking suppliers of the devices for enough to upgrade 50 crosswalks per year, for nine years. All told, that would more than quadruple the current number of crosswalks with RRFBs in Calgary, and Coun. Peter Demong believes the change will save lives. "I think it has already saved lives," he said of the technology. Demong was behind a pilot project in 2012 that introduced the devices to Calgary. "What grabbed my attention was money, money and money," he said of the RRFBs, compared to the cost of traditional, overhead signals. "It just made no sense whatsoever to continue to put these $75,000-to-$100,000, big overhead lights on when you can get away with doing these anywhere from $25,000 to $40,000." Price aside, the pilot project also found the devices were effective at getting drivers to yield to pedestrians at crosswalks. In all eight locations initially studied, driver compliance increased. A report from that time found compliance was "already high" (in the 70-to-90-per-cent range) at those crosswalks but increased to near-perfect in most cases (more than 95 per cent in all but one) after the RRFBs were installed. The city has since added RRFBs to dozens more crosswalks, including the one across the ramp from 14th Street N.W. to Memorial Drive, where Peter Hunnisett was walking with his young son on Monday. He frequently crosses at that point and says the rapidly flashing lights tend to get drivers' attention — and they usually stop. "On this one I would say they get it about three-quarters of the time, which might be better than most places," Hunnisett set. Still, he believes the beacons, alone, aren't enough to make Calgary as pedestrian-friendly as he would like it to be. "I think probably a better choice would be to actually think less about cars first and think about the fact that pedestrians aren't going to want to walk in the first place if they don't enjoy the experience," he said. "If they started designing right from the ground up, thinking about people and cars — and cars aren't necessarily the No. 1 choice — that would be wonderful."